La La Land joins an elite club after receiving 14 Academy Awards nominations morning. Damien Chazelle’s musical about lovers in Los Angeles tied for most nods ever received by a film alongside All About Eve and Titanic. Now it seems just about preordained for glory when the ceremony rolls around. 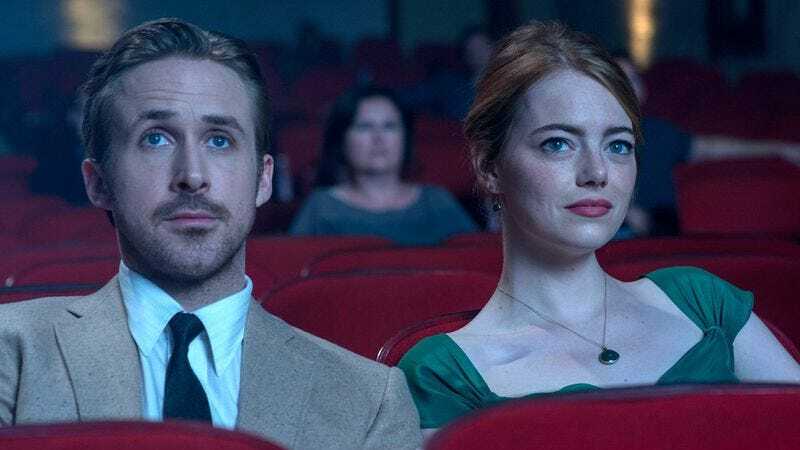 La La Land will be competing against eight other films for the top prize, including Moonlight and Arrival, both of which received eight nominations a piece. Rounding out the category are Fences, Hacksaw Ridge, Hell Or High Water, Hidden Figures, Lion, and Manchester By The Sea. The success of the WWII epic Hacksaw Ridge with six nominations, including one for directing, indicates that Hollywood has fully re-embraced Mel Gibson despite his years of offensive behavior. Following a year when the Academy completely ignored actors of color, 2017 saw seven nominated: Denzel Washington, Mahershala Ali, Dev Patel, Ruth Negga, Viola Davis, Naomie Harris, and Octavia Spencer. In the acting categories, the makeup of Best Actress was most likely to throw prognosticators for a loop. The lauded performances of Annette Bening and Amy Adams in 20th Century Women and Arrival, respectively, were left off the list. The Academy’s warm response to Adams’ brainy sci-fi film in other categories makes her snub especially perplexing. Meryl Streep, however, added another nomination to her haul for the tepidly received Florence Foster Jenkins and, perhaps, her Donald Trump-skewering speech at the Golden Globes. Meanwhile, Michael Shannon snuck into Best Supporting Actor over his Nocturnal Animals co-star, Aaron Taylor-Johnson, who won the Hollywood Foreign Press Association’s honor. The Oscars will be broadcast February 26 with Jimmy Kimmel serving as host.